Probiotic-10 is a blend of ten bacterial strains clinically validated for their support of healthy immune system. A healthy immune system is a little vague, but Now Foods tries to avoid making any claims, because the law does not permits it. Making a little research on the strains in their proprietary blend, it looks like they aimed the blend at people with imunodeficiencies and allergy sufferers. The blend should be very effective calming down hyperactive immunity systems, reducing chronic inflammation, and protecting against pathogens. The blend seems to also be effective on weight control, but as you know, nothing is magical when it comes to losing weight, you have to work hard. The FOS that is packed in the capsule will work in tandem with the probiotics to enhance the effects. Fiber can give you heartburns, but if you take them with probiotics they will double the effects of the microorganisms, without the side effects. For a full review check this page. 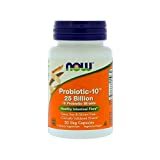 This is a review of the NOW Foods Probiotic-10 25 Billion. With 10 strains, and 25 billion CFU per capsule, the product focuses on improving immunity and appeasing allergy conditions. The Now Foods' probiotic blend is affordable and efficient, as most of their products.